This year’s UNCTAD Economic Development in Africa Report 2016 finds that Africa’s external debt ratios appear manageable, but African governments must take action to prevent rapid debt growth from becoming a crisis, as experienced in the late 1980s and 1990s. NAIROBI, Kenya, July 21, 2016 – African governments should add new revenue sources to finance their development, such as remittances, public-private partnerships, and a clampdown on illicit financial flows, an UNCTAD report said on Thursday, warning that debt looks unsustainable in some countries. At least $600 billion will be needed each year to meet the Sustainable Development Goals in Africa, according to the report which is subtitled Debt Dynamics and Development Finance in Africa. This amount equates to roughly a third of countries’ gross national income. Official development aid and external debt are unlikely to cover these needs, the report finds. A decade or so of strong growth has provided many countries with the opportunity to access international financial markets. Between 2006 and 2009, the average African country saw its external debt stock grow 7.8 percent per year, a figure that accelerates to 10 percent per year in the years 2011–2013 to reach $443 billion or 22 per cent of gross national income by 2013. 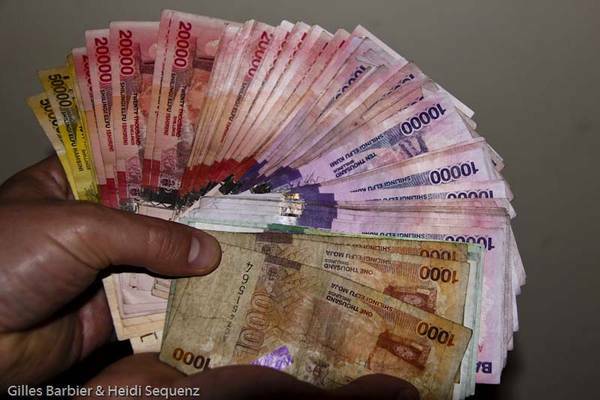 Several African countries have also borrowed heavily on domestic markets, the report finds. It provides specific examples and analyses of domestic debt in Ghana, Kenya, Nigeria, Tanzania, and Zambia. In some countries, domestic debt rose from an average 11 percent of GDP in 1995 to around 19 percent at the end of 2013, almost doubling in two decades. “Many African countries have begun the move away from a dependence on official development aid, looking to achieve the Sustainable Development Goals with new and innovative sources of finance,” Dr. Kituyi said. Together with the global community, Africa must also tackle illicit financial flows; which can be as high as $50 billion per year. Between 1970 and 2008, Africa lost an estimated $854 billion in illicit financial flows, roughly equal to all official development assistance received by the continent in that time. And while governments should be vigilant of the borrowing risks, public-private partnerships have also started to play a more prominent role in financing development. In Africa, public-private partnerships are being used especially to finance infrastructure. Of the 52 countries considered during the period 1990-2014, Nigeria tops the list with $37.9 billion of investment, followed by Morocco and South Africa. “No, I don’t care about that, the international — what they decide is entirely their own affair — their own affair. I’m concerned about Zimbabwe, and I’m concerned about the lives of the people of Zimbabwe. And don’t forget, it was my party which brought democracy into the country. I fought the British. We had to fight the British for democracy for one man, one person, one vote” – Robert Mugabe (Amanpour. 24.09.2009 interview – CNN). There are these days that vicious attacks from President Mugabe will be normal, where the words of oppressive colonial attacks on Zimbabwe will be addressed with flowery perfection from the old-timer, the long-running President of the Southern African Nation of Zimbabwe, the country he have had in his hands since the Lancaster Agreement and the release of the Country from the British Colonial. At one point he we’re acting more British than African, but with the Age, he has more and more hated the Europeans and Americans, as their respect for the leader have dwindled. The Respect has fallen as much as the respect for a McDonalds Burger has gone down in the West. He we’re the man at one point, until the Aparteid of South Africa went sour and his gold-star got taken away. After that he must felt betrayed as he was the man of the continent and the man who even we’re knighted by the United Kingdom at one point and even a candidate for the Nobel Peace Prize in 1991. So the rich history of the man and ruler is vast. My words and reasoning will be belittling the histories and the vicious need for power the man have. Though there vast amounts of irony from the leader, that is now clear as the sun is setting and rising again. Just as he has blasted the West, had have land-reforms exiting the White farmers and their plantations as they we’re the grand issue of the land. Surely there we’re in-balance between the ‘Africans’ and the ‘Afrikaans’; which is well-known as the British and the Dutch settlers took the best land and let the ‘locals’ become workers and renters. It was natural for anyone who lead to wish for a difference and create a better life for more citizens of Zimbabwe. Though the technic of giving ZANU-PF Elite the best land and evict landowners that have run farms for generations without compensations is just critical; though the colonial powers stole the land, there are ways of punishing the generation for the sins of the for-fathers while still trying to mend on the insufficient systems of the present day. Something that is lost tale and lost option as brutality have become the station of Mugabe, ever since he got his Army and Police trained by the North Koreans. As long as he got rid of his worst opponent in Joshua Nkomo and even raided and massacred the loyalist in the Matabeleland. With this history and with his reign of power; all of these initial acts of violence and the control of the state; that he has exhausted the state and the economy, while blowing the donor funding from the West and later when they quit funding his oppressive regime. Saying it was colonial acts of belittling African Nation, while he himself was harassing people and detaining opposition of ‘Movement for Democratic Change’. Even at one point accepting the power-sharing agreement made by Thabo Mbeki, though partial and used by Zuma to overpower him in South Africa, the last stain on Mbeki; we’re the weak agreement that gave the Executive back to the loser Mugabe in 2008, while the winner got the VP Tsvangirai. So the tried peaceful transition to another leader was not successful and a reason why the 92 year old man is the king-pin of the Republic Zimbabwe. “I think in relation to sport, we set out the position many, many times, but nothing that happens in relation to that should take anything away from our total condemnation of the way that Robert Mugabe is making the plight of the people in Zimbabwe terrible. Now whatever issues there are to do with sport, you can put those to one side for a moment, the issue is how do we make sure that we put the maximum pressure on Robert Mugabe’s regime in order that we change the situation in Zimbabwe and change it for the better politically, but also in humanitarian terms as well. And I totally agree with what Prime Minister John Howard was saying just a moment or two ago. There are no grounds, so far as we can see, for saying that there has been any significant progress at all, indeed if anything the situation has got worse, and that means that we have got to keep up maximum international pressure upon the regime” – Prime Minister Tony Blair (Jon Howard Interview at Joint Press Conference with PM Howard of Australia, 07.05.2003). So that he blames the West and address the West for the shortcomings is natural, but the Economic instability is not all on the Western Sanctions, as that is also because the ZANU-PF, the Benzes bought under the ZANU-PF elite while the schools depleted, the civil servants delayed salaries, the missing of foreign exchange and dollars in the country are run-out. There are reasons as the nepotism, the unstructured business, the export and the agricultural inefficiencies together with draught and all the weak governance that creates deficiencies and devalued the economy. There are reasons for the economy crashed as the empty coffers while the elite was eating elephants and entertaining the Luxury Hotels in the Honor of the President Mugabe latest birthday. So there is money, but they are spent on truffles for the President, instead on citizens and services for the public. That is not the fault of the Western that he claims, together with reforms and not institutions, but instead all centralized in the hands of President. That is from the same man who has put his hate on the West, as they are sanctioning the Zanu-PF regime and Mugabe long-term reign of the Nation. The same man who have said anything possible about the Americans and British, the man who has claimed that they are the reason for all the troubles, have no quarrel this year and of recent years traded with the Chinese government and their national companies. Like there 128 development projects from 2000 – 2012 made by the Chinese in Zimbabwe. While the Zimbabwean Government have also planned to go from US Dollar to Chinese Yuan (was planned in 2015) as the official currency as the Mugabe regime is more in the pocket of the Chinese, than everybody else (Archdeacon, 2016). This is also a way of Chinese to grade their power and take more control on the African Continent, as the Zimbabwean have such a monetary fiscal issues that anybody who will clear debt and will drop fresh coins to the regime is friend, especially when there only optional to let the Chinese work and build there; as a way of renting the country away, while the Elite eats the money. Something the country wished the IMF would let them do, but since they are Western, French and even US Dollar fueled they are not as willing as Beijing, therefore Mugabe will easily play kind Uncle Bob, while blasting the West, which is a good luck for the Zimbabwean Government. Though we know and they know, they would easily said ‘YES’ to the loans from the International Monetary Fund. So the hatred towards the once who was the allies and friends, like he was once so proud of English culture and being knighted, the man who once was their ally and turned into a villain, the question if he was a needed villain for the British, as he fought their colonial rule under Smith Government in Rhodesia and made the new state Zimbabwe. Which was a feat and was something that people could look up-to, when he surged the power he consoled it by all means and even ended lives to keep it; this what happen to Nkomo and to the once that he used the military on, as they we’re not loyal to him; instead to the Opposition that wasn’t him. That is why it is ZANU-PF, as they we’re two parties to take control over and even consolidated with all ways. The same he has done with the state and therefore the disarray and the economic instability, therefore the stop of using own currency and American Dollar together with the newly planned transition towards the Chinese Yuan. There are an issue and aggression from Mugabe towards the West, he has fought them all his life, but also had a an admiration for it, as he would easily wear Western clothes and import expensive westernized products, as his wife spends the government funds there and not in Beijing, even if the government gets the funds there and development projects from there now, as the IMF and other does not offer the sanctions nation with fiscal financial subsidizes and loans. Peace. Interesting findings from the AG report on “Central Government and Statutory Corporations” – Part Three! Here I will Travers through the report of Auditor General of Uganda’s Annual Report for the year ended 30th June 2015. This is on: “CENTRAL GOVERNMENT AND STATUTORY CORPORATIONS”. I will take the quotes and stories that seem to show parts of how the Government of Uganda works and what the Auditor General have cared about addressing in this specific report. Take a look! This here is Part three! “Ministry of Local Government’s expenditure revealed that the entity charged wrong expenditure codes to a tune of UGX.12,086,792,676. This constituted 40% of total actual expenditure for the Ministry of Local Government. Whereas the funds were spent on items for which they were not originally budgeted for, the accounts have been presented in a way that reflects that the amounts were spent on the earlier budgeted items” (P: 215). Comment: This here came up in the value for money edition from the AG, now here is the whole picture. How the management of the Local Government Councils that doesn’t follow procedures for the items bought into the LGC. As this is seen by the review from AG and that is scary parts is the amount of monies used without procedure and not following budget. So they can by rollex to the council meetings or fancy watches for all we know. Millennium Village Project II: “Conflicts between appointed and elected officials in Local governments resolved” (…)”International conference with IPC conducted” (…)”Despite receiving all the funds no conference was held” (…)” There was budgeted UGX 200m and the allocated UGX 200m” (P: 217). “Personal advances to the tune of UGX.3,827,011,454 were not accounted for by the respective officials. As such, I could not ascertain whether the funds were used for the intended purpose. It was also noted that the unaccounted for funds were not reflected as advances receivable in the financial statements at the end of the year. The financial statements were therefore misstated by UGX.3,827,011,454” (P: 220). Comment: Certain officals have been gotten paid advances without proving where the monies have been used; surely this is questionable actions from the Local Government Councils. “Withholding tax to the tune of UGX.36,561,220 from payments of UGX.922,845,962 to SHL and AVC for supply and installation of solar packages in the districts of Kabarole, Sheema, Rakai and Lwengo was not deducted for onward remittance to URA contrary to the tax law” (P: 235-236). “Audit review revealed that only two firms (SHL and AVC) won all the six contracts awarded during the year. However scrutiny of their bid documents revealed that they both shared an address as “P.O. Box 9784, Kampala” raising doubt as to ownership of the two companies given that at some point they were the only bidders who responded to the bids” (P: 236). “It was observed that invoices with higher amounts were entered on the system leading to overpayments of UGX.1,787,317” (P: 237). Comment: This here proves that there is something fishy in the financial audit on the contracts and the procurement of the solar packages. The statements and findings prove that two set of companies where at the same postbox; and they didn’t open an open bidding to the public as there should have been. 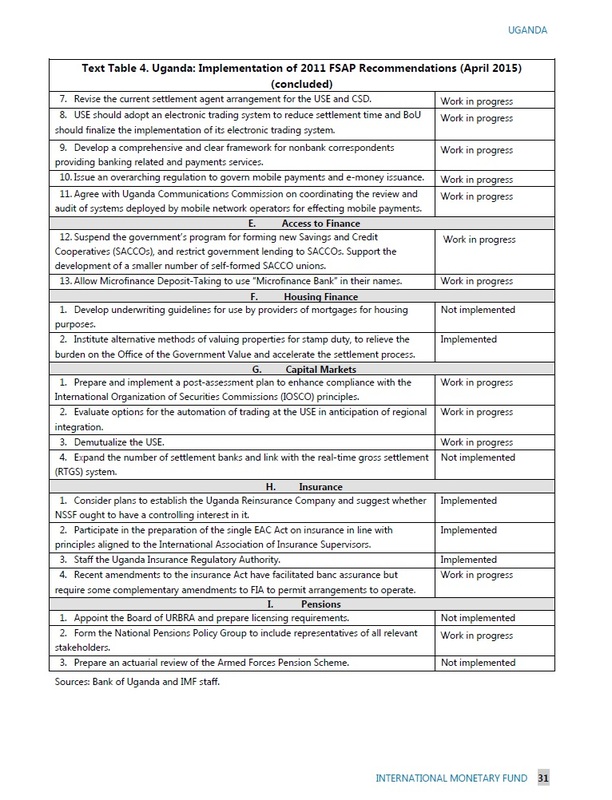 “It was noted that GoU contribution amounting to UGX.187,654,400 was released by Ministry of Finance, Planning and Economic Development to the project through the Ministry of Local Government Treasury General Account where the funds were subsequently spent” (…)”ADB Loan: Further, out of the released amount of UGX.187,654,400, UGX.102,932,000 was diverted by the Ministry and used on non-project activities” (P: 259). Comment: Out of the loan delivered the CAIIP III the funds was not used we’re they was supposed to be allocated and service delivered as was budgeted. “It was noted that out of UGX.700,000,000 expected from the Government of Uganda, however, only UUGX.104,062,000 was disbursed. This led to a short fall of UGX.595,938,000” (P: 273). Comment: The GoU has just allocated about 14% of the amount that was budgeted. That such little funds that was to the UGOGO so they can’t do what it is supposed to do. “Section 2.2 of NUSAF II Operational Manual requires that at least 80% of previous disbursements are accounted for before replenishment to a subproject. The policy also requires that all funds to subprojects should be accounted for within six months. It was noted that UGX.5,159,940,305 out of UGX.281,974,035,473 disbursed to subprojects remained unaccounted for as at 30th June 2015” (P: 278). Comment: This here prove how little check up of the project that exisist. There is funds that are unaccounted for and that should be worrying, they could be used for ginger-snaps for all we know. Think that was enough for today. More to come. Peace! The ClimDev Africa Special Fund (CDSF) launched its first project in Ethiopia on August 3 to help the country cope with, and build resilience to, climate change by enhancing capacity in climate monitoring, data analysis, interpretation, forecasting and dissemination for use in national decision-making. The project entitled “Strengthening Climate Information and Early Warning Systems for Climate Resilient Development and Adaptation to Climate Change in Ethiopia – (SCI-EWS)” will be implemented over a span of three years at a total cost of EUR 1 million. Speaking at the launch, Ato Alemayehu Tegenu, Ethiopia’s Minister of Water, Irrigation and Energy, noted that, “Enhancing the capacity of the country’s National Meteorology Agency by promoting strategies that effectively manage risks; reduce vulnerability; and maximize opportunities associated with climate variability, change and extreme weather events for different socioeconomic sectors, is central to our commitment to build a fully climate resilient green economy by 2025.” Improved service delivery and cost recovery systems as a result of the project, are expected to generate additional income for the Government to ensure the future sustainability of the system together with the National Meteorological Agency. 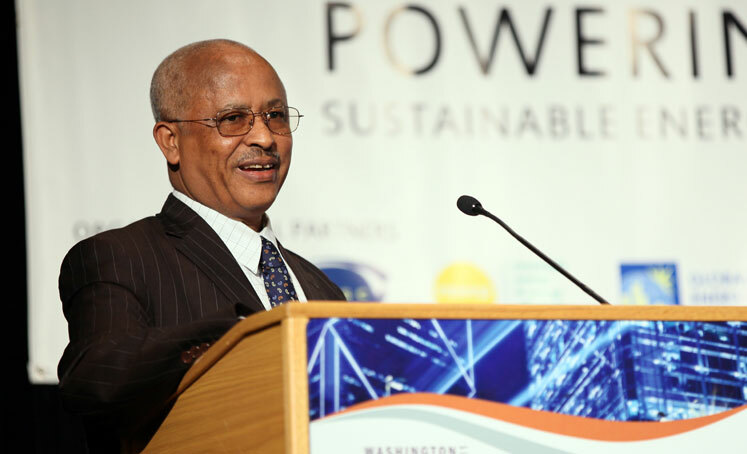 In addition to Ethiopia’s Minister of Water, Irrigation and Energy and staff, the launch was also attended by representatives from the Ministry of Finance and Economic Development, the African Union Commission, the United Nations Economic Commission for Africa, the African Development Bank (AfDB), ClimDev-Africa, and non-governmental organizations. Following the launch, relevant National Meteorological Agency staff attended a three-day workshop on AfDB project implementation rules and procedures, such as procurement and monitoring and evaluation. Ethiopia is the first country to benefit from the Fund. Launched in November 2014, the ClimDev Africa Special Fund (CDSF) is the funding arm of ClimDev Africa, a joint programme between the African Union Commission, the United Nations Economic Commission for Africa and the African Development Bank. Housed at the AfDB, it is a demand-led fund that pools resources to finance investment activities on the ground across Africa for the generation and use of climate information for climate-resilient development. Grants are provided to projects in line with the ClimDev-Africa Programme’s goal, purpose and results areas and are implemented by national and regional organizations at all levels on the continent. 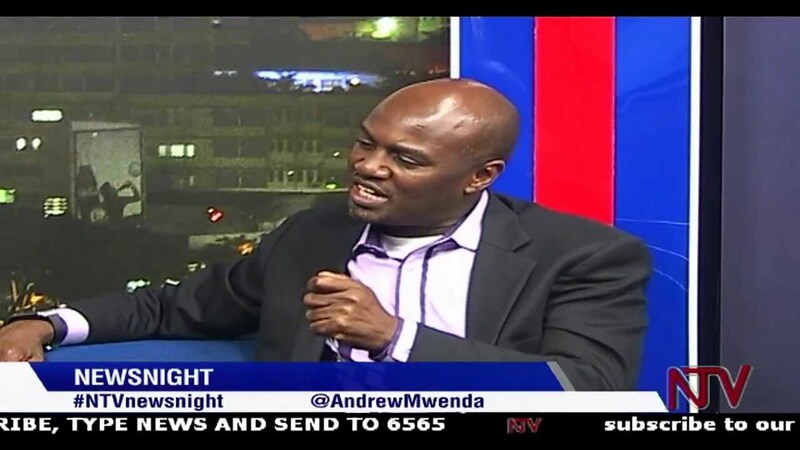 It’s been a long walk for Andrew Mwenda the former Political Editor of the Daily Monitor of Uganda. The former enemy of the regime, the man who got 15 counts against him in court at a set of time for writing against the NRM regime is today another man. He has changed with quotes leading in Chimp reports sadden me. At some point I had faith in the man as a Nobel journalist who fought a just cause. I will show from today and famous words from before to show and mirror the man and how he has fallen from grace. Here I will go back to the letters which shows his colors in black and white. While taking the stand against in one minute and later being for it. This here is about the reach from today and the past where he said differently. “With a budget of 24 trillion, I think stealing 500 billion is peanuts (it’s a theft rate of less than 2%) In the wider scheme of things, a 2% theft rate is really small. It means that you are utilizing 98% of the money correctly” (…) “May be the stolen 500B is what ensures a stable political order without which we would have civil war. It is hard to tell. The point is, even if you were right about the loss of 500B; you don’t know the other opportunity cost of not stealing it!”(Waswa, 2015). “The major shareholder is given more investment deals in Uganda. I am a citizen of Uganda, not a mercenary. I therefore cannot betray the future of my country in order to retain the privilege of working or writing for Monitor. The future of Uganda is more than anything that money can buy” (…) “Because Monitor has succumbed to bribes and intimidation from the state, it is no longer the institution I was once proud to serve. It has lost its soul. It has betrayed its readers and listeners. It has betrayed Uganda. It has betrayed Africa. It has betrayed the cause of liberty and freedom. It has betrayed humankind. I cannot be an accomplice to this death of a dream whether because of state intimidation or of sweet heart business deals between the chief of state and the major shareholder. To do so would be identical to the action of Judas Iscariot who betrayed Jesus for 30 pieces of silver” (Mwenda, 2007). “This is to request you to pay Independence Publication Limited (IPL) US$ 200,000 (two hundred thousand United States dollars) only for adverts in the Independent newsmagazine for the government of Rwanda for the year 2008” (Mwenda, 2008). “the country needs to implement drastic reforms in order to bring its fiscal house in order and promote development using its own resources—starting with a more efficient and enforced system of taxation” (…) “tax collection by the Uganda Revenue Authority amounts to about 12 percent of GDP—well below the sub-Saharan African average of 18–20 percent and far from the government’s target of 24 percent” (…) “Uganda does not need more foreign aid” (…) “Rather, it needs to improve its tax administration by investing in better staff and motivating them with better pay and better facilities” (Probe International, 2010). “As capital, Mwenda was advanced $1 million from state consolidated fund termed as classified to start this magazine, then to help fight President Museveni’s Government that Kagame was not happy with” (…) “Mwenda who is on a monthly basis paid $200,000 from state coffers, for his rebuts and propaganda against Kagame’s critics and in defence of the dictator has no shame to compare Kigali roads and streets to Dubai, London and New York, forgetting that these roads are not more than 2 years old, compared to those that have stood a lifespan of more than 100 years” (Gasasira, 2013). “Corruption is debated in mainstream media as a criminal act whose primary objective is to enrich individuals involved in it. Although it manifests itself this way, this is a residual part of the problem. The real issue about corruption in Uganda is that it is the essence of how political power in the country is organised, exercised, allocated, distributed and reproduced. Corruption is actually our system of government” (…) “President Yoweri Museveni’s greatest triumph has been to organise corruption on a broad-based scale. By expanding cabinet, the number of presidential advisors, increasing the number of districts, creating many commissions and autonomous government agencies and by establishing many security outfits, he has created highly diversified centers for corruption. Even the opposition has districts where they can goad themselves. Where in other nations corruption has been explosive, in Uganda it has been integrative” (Mwenda, 2015). When you look through his quotes and what he has taken a stand for corruption in the past. And how he accepted certain pay-offs from Rwanda in the beginning of the Independent Magazine as early as 2008. While has had issues with barking at the government of Uganda. This is sadly ironic for this public character and writer that all people who knows Uganda, knows about. Therefore when the colors are off, you know see who he really has become. So when you see how that money is making him blind on Rwanda and their issues. It is understandable why he will be a strong supporter of the third term in Rwanda. I am sure we will see more of that in the near future. But this here is about corruption and shows how he is not committed to it when it comes to Republic of Rwanda. Secondly he has from the times of 2007 to 2015, shows the changes and how he has become something else then the man he wanted to be in 2007. If he really wanted to be that man with integrity and honor. He has now lost his marbles in the recent year or tired of being a true renegade against injustice in Uganda. Since he all of a sudden is fan of corruption and believes that generate actual growth. This in a country that has more and more debt, more and more local counties and ministers which cost more money, while it isn’t generating more tax money. That does not make sense Mr. Mwenda? Does it? Your supposed to an enlighten man, but your arguments today beats by your own old words. I am not sure if he is now positive since he claim that the government of Uganda is integrated with Corruption (which he said in January this year) then now in August he claims that it’s okay steal 500bn shillings when the budget is as much as 25 trillion shillings. Because it’s peanuts, it’s a saying that he now can think about: Respect is hard to earn and easy to lose. Something he has done now. With actually proclaiming for the world it’s okay to take 500bn from the state-coffers to their own gain then actually making something decent for their country. Mr. Mwenda I am sorry whatever reason you can say that thieving is a good thing is wrong. It’s like tomorrow you will claim killing and the plague is great like Malthus is famous for saying: “Instead of recommending cleanliness to the poor, we should encourage contrary habits. In our towns we should make the streets narrower, crowd more people into the houses, and court the return of the plague. In the country we should build our villages near stagnant pools, and particularly encourage settlements in all marshy and unwholesome situations. But above all, we should reprobate specific remedies for ravaging diseases: and those benevolent, but much mistaken men, who have thought they were doing a service to mankind by projecting schemes for the total extirpation of particular disorders. If by these and similar means the annual mortality were increased … we might probably every one of us marry at the age of puberty and yet few be absolutely starved” (Marjie, 2009). I am waiting for Mr. Mwenda to turn a blind eye to other issues in society. But today’s stupid comments on corruption are as mad as population control from the late Thomas Robert Malthus who lived 1766 – 1834. And Mr. Mwenda want to be seen as enlighten and educated TED talk’s kind of editor. With this kind of reasoning he is losing it. And I don’t know why, I am not sure if he knows why. He surely has become something else then the man who went away from a great position in the Daily Monitor to make his own workplace in the Independent Magazine in Uganda. Which is sad see if he has sold out totally, he will not be a crucial voice into the elections, which is coming in the 2016. He is surely not the man who needed a bail out in 12 August 2005 after being too critical on the KFM radio. That made the government angry so they actually turned off the radio transmitters for a week (Article 19, 2005). So the man who has had issues with the government must has grown tired and wanted a decent day job instead of being a renegade watchdog with his own magazine. This has led to the quotes today which don’t fit the old reasoning of the same man. Mr. Mwenda, where did your mind go? And why did you change your mind? Peace. Mwenda, Andrew – ‘Re: Resignation’ (16.08.2007) – Letter sent to the Managing Director of Monitor Publication. Mwenda, Andrew – ‘Re: Payment for advertisement’- Letter from Independent Publication Ltd to Ministry of Finance, Republic of Rwanda (10.03.2008). 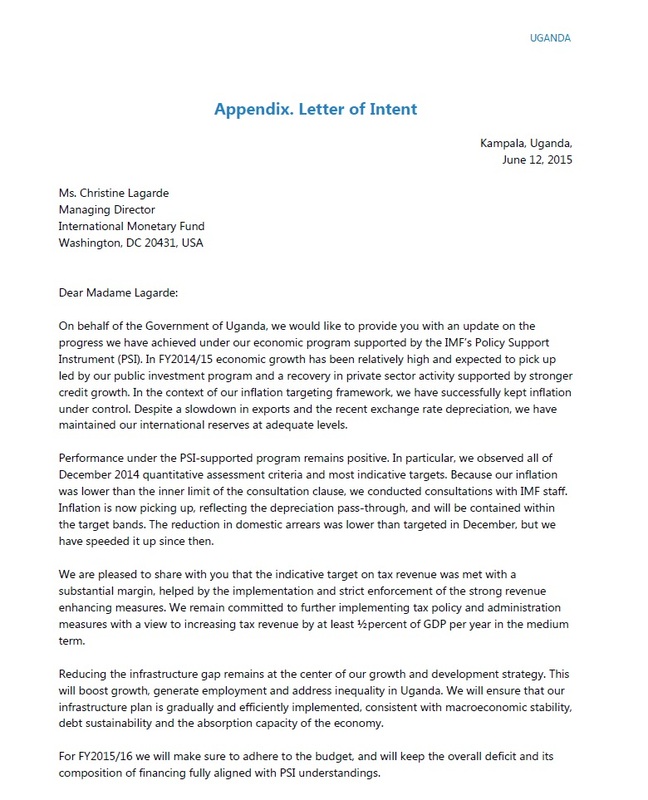 Now I will go through how the IMF is describing the economic situation in Uganda. It will have similarities with the budget of 2015/2016. Seem like the Ministry of Finance in Uganda. The numbers and fiscal standards are exactly the same. Still I think it will good to see and give what the Western Hemisphere and the monetary organ is saying about the economy of Uganda. So that people can see the similarities and also the difference quotes from the situation. 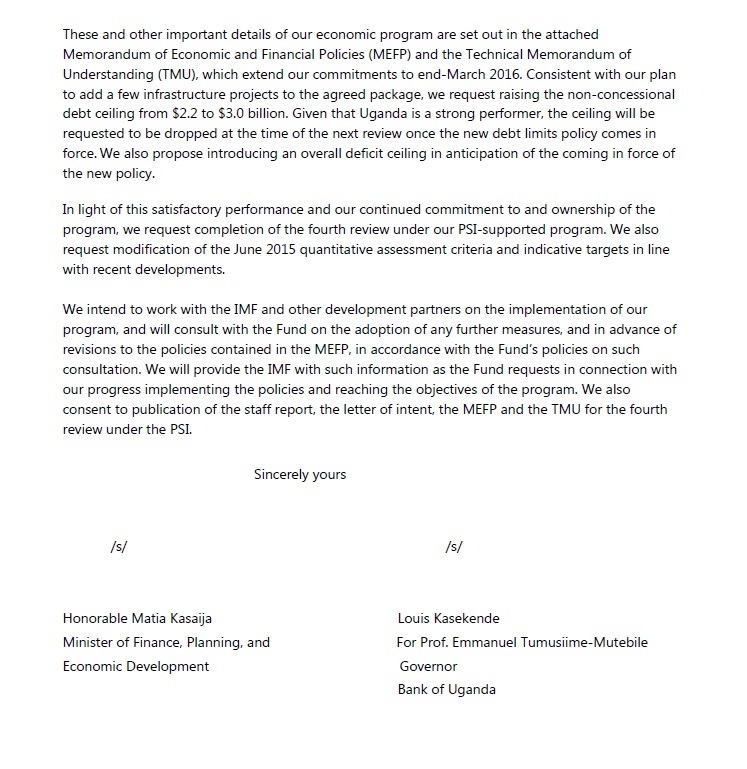 “The economic policy mix is expected to remain focused on attaining growth and inflation Objectives” (…) “The Bank of Uganda is encouraged to remain firmly focused on the maintenance of price stability” (…) “Enacting regulations to implement the new PFM Act and a charter of fiscal responsibility, and improving cash management are critical remaining reforms. Amending the Bank of Uganda Act and enacting financial institutions legislation are key steps to further enhance central bank independence and strengthen financial resilience”. “Uganda’s recent economic performance has been favorable. Real GDP growth is projected at 5¼ percent for FY2014/15 supported by a fiscal stimulus and a recovery in Private Consumption” (…) “Economic policies in FY2014/15 have supported growth and stability objectives. The fiscal deficit is estimated at 4½ percent of GDP, below previous projections, on account of a sharp tax revenue increase” (…) “The outlook is promising. Growth is estimated at 5¾ percent in FY2015/16 and an average 6¼ percent over the medium-term, driven by scaled-up public investment and a rebound in private demand”. “Directors stressed the need for continued fiscal discipline in the pre-electoral environment, and recommended strengthened communication with the markets” (…) “Directors welcomed the adoption of the Public Financial Management Act, and advised prompt enactment of its regulations”. “Security concerns following unrest in neighboring countries and terrorist attacks in the region have weighed on Uganda’s spending needs, exports, and remittances. Declining donor support in reaction to concerns about governance and human rights and reduced development partners’ aid budgets have spurred domestic borrowing requirements” (…) “During a period of moderate growth, inflation has come down significantly from its 33 percent peak in 2011; and despite a decline in international reserves and a pickup in public debt, both remain at comfortable levels” (…) “The reduction in the stock of domestic arrears was smaller than targeted reflecting a decision to backload intra-year repayments, but the annual target is expected to be met. Contracting of nonconcessional borrowing (NCB) for hydropower plants (HPPs), roads, and electrification was within the $2.2 billion limit. Most end-March ITs were met” (…) “The approval of the Public Financial Management (PFM) Act in November 2014 was a major milestone, and structural benchmarks on finalizing preparation on its regulations and the Charter of Fiscal Responsibility (CFR) were observed. The Treasury Single Account (TSA) set-up has laid the stage for improved cash management although more time will be needed to eliminate movements of cash and incorporate donor accounts in the system. 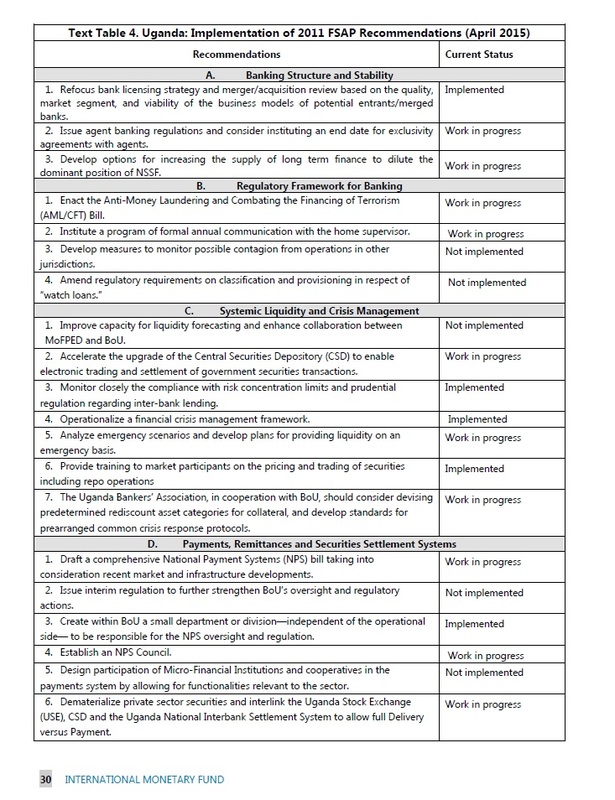 The submission to parliament of amendments to the Bank of Uganda (BoU) Act was postponed” (…) “the government has started the implementation of an ambitious investment package aimed at narrowing the infrastructure gap, enhancing regional integration, and preparing for oil production”. “real GDP growth was 4½ percent in FY2013/14, driven by services, trade, construction, and manufacturing—below the estimated potential of about 6 percent” (…) “The nominal exchange rate against the US dollar appreciated by 7 percent in the year through February 2014, and since then depreciated by 20-25 percent” (…) “The real effective exchange rate appreciated by about 4 percent in 2014, mainly reflecting the weakening of Uganda’s main trading partners’ currencies” (…) “Annual core inflation fell to 2.7 percent in December 2014 and rebounded to 4.8 percent in May 2015” (…) “GDP was revised upwards by 17¼ percent in FY2009/10, the base year. The services sector and to a lesser extent the agricultural sector increased their share in GDP, while the share of industry and construction declined” (…) “Short-term benefits of the oil price decline have been less pronounced in Uganda than in other countries in the region. In the past nine months, petrol average pump prices have declined by 10 percent in domestic currency” (…) “Oil investments might be delayed in the context of lower profitability. Moreover, many interrelated investment decisions are dependent on the oil price, including granting production licenses; signing commercial and financial arrangements; developing engineering, procurement and construction plans; and agreeing on transnational infrastructure works” (…) “The current account deficit remained large owing to structurally high trade deficits. Imports of capital goods and petroleum products are increasing, while both coffee and non-coffee exports have stagnated since mid-2013 reflecting depressed food exports to South Sudan” (…) “The monetary policy transmission asymmetry is explained by the banks’ cautious focus on loan recovery and their high operating costs, coupled with some crowding out effects as government’s domestic borrowing requirements increased at that time” (…) “The number of commercial banks has increased from 14 to 25 with a large influx of foreign banks, which currently hold 80 percent of assets” (…) “the BoU kept a tight policy stance, holding the CBR constant at 11 percent from June 2014 to April 2015, and then raising it to 12 percent, on account of global developments and the ongoing and expected exchange rate pass-through. The BoU’s intervention in the foreign exchange market has been focused on its program of announced dollar purchases for reserve build-up, but in the last few months it has been intervening on the sale side to smooth the fast-paced shilling depreciation. This intervention, along with increased infrastructure-related government imports, drove reserves down from $3.2 billion in end-December to $2.9 billion in mid-May (about 4 months of imports)”. “Public investment financing, alongside weaker exports and tourism receipts, will drive the current account deficit up while preserving reserves at 4 months of imports” (…) “Low consumer prices—with average core inflation projected to remain within the PSI consultation inner band at 3½ and 6¼ percent for end FY2014/15 and FY2015/16″ (…) “Slower growth in key trading partners and further spillovers from lower global liquidity could trigger capital outflows, squeezing liquidity and generating currency mismatches for banks and corporations. In the medium term, the complex commercial and legal aspects surrounding FDI in the oil sector could delay the planned investments”. “The latter has been at the center of the authorities’ economic agenda as infrastructure investments of around $11 billion—including PPPs—are expected over the next ten years” (…) “With recoverable crude oil reserves of 1.7 billion barrels out of potential reserves of 6.5 billion, oil production would start in FY2020/21 under a model that entails a crude export pipeline and a domestic refinery” (…) “Uganda ratified the Monetary Union Protocol, and has been actively participating in work to establish EAC regional institutions and to create a fiscal surveillance process” (…) “the Uganda Revenue Authority (URA) to improve enforcement and compliance, but a sustained increase in the ratio will require incorporating the large informal sector into the tax-paying portion of the economy and ensuring that large taxpayers comply with their obligations” (…) “Sustainable financial deepening will largely rely on making steady progress on financial inclusion, which will in turn depend on actions to boost the bank deposit base; enhance the intermediation role of non-bank financial institutions, including the National Social Security Fund (NSSF); and develop the money and capital markets” (…) “Staff’s debt sustainability analysis, which includes the infrastructure package as a whole, concludes that the public and publicly guaranteed external debt-to-GDP ratio in net present value (NPV) terms would peak at about 25 percent in FY2020/21. Even combined with domestic borrowing plans, total public debt would remain well below the benchmark associated with heightened vulnerabilities” (…) “The tax-to-GDP ratio in Uganda was one of the lowest in the region prior to the GDP rebasing and is definitely the lowest afterward. Over the past ten years the ratio only increased by 0.2 percentage points per year, on average” (…) “Planned improvements include URA’s efforts to assess income from rental properties and identify businesses that are accessing local services but not filing national tax returns. Use of enhanced controls and creation of a single central processing center for all customs clearances should boost customs revenue” (…) “EAC convergence criteria, Uganda has targeted a tax-to-GDP ratio of 25 percent by 2021”(…) “Social protection in Uganda is entrenched in the Constitution, Vision 2040 and the NDP II. Interventions have nonetheless been limited and fragmented—with only 0.4 percent of GDP a year devoted to direct income support and 1.2 percent of GDP to total social protection”. “The overall deficit increased by 2 percent of GDP between FY2011/12 and FY2014/15” (…) “The overall deficit is projected to increase by an additional 2½ percentage points by FY2017/18 fueled by a continued expansion in capital spending (3¾ percentage points) and a small increase in current spending (¼ percentage point), and curtailed by a further improvement in revenues of at least ½ percent of GDP each year” (…) “the supplementary budget used part of the windfall revenue and expenditure savings to cover operational shortfalls at several ministries, and Electoral Commission outlays, among other pressing needs. All in all, the overall fiscal deficit is now projected to reach 4½ percent of GDP (6¾ percent in the program) and issuances of securities in the domestic market should remain within the target” (…) “The FY2015/16 budget will increase the overall fiscal deficit to 7 percent of GDP largely financed by NCB on favorable terms” (…) “The contingency provision was reduced by 0.2 percent of GDP at the time of budget approval to facilitate one-off spending on police activities linked to the election and allowances to parliamentarians, leaving little budget flexibility and requiring prudent execution in the year ahead”. “Some challenges remain, including insufficient institutional arrangements to prevent government’s use of deposits in BoU accounts beyond agreed levels, and shortcomings in inflation forecasting capabilities and fiscal-monetary policy coordination” (…) “Given the high share of imported goods in the CPI, import prices play a key role in inflation behavior, with an estimated pass-through factor of 0.4–0.5” (…) “The BoU has taken steps to reduce volatility in overnight market rates by allowing all banks (previously only primary dealers) to access BoU operations”. “The BoU does not stress test banks’ resilience to lending rate hikes because of insufficient data availability” (…) “High dollarization. 37 percent of deposits and 43 percent of loans are denominated in foreign currency” (…) “banks’ business models, with a large share of assets devoted to investments in Treasury bills, reflect cautious risk taking, as well as curtailed policy predictability given the large swings in interest rates, thus jeopardizing credit growth”. “Core fiscal targets: These targets are based on the EAC convergence criteria, and consist of an overall deficit target of 3 percent of GDP by FY2020/21 and an annual debt ceiling of 50 percent of GDP in NPV terms”. “That fiscal policy decisions will be strictly aligned to the budget is essential to influencing banks’, corporations’, and households’ behavior. Even more critical, however, is that policy implementation adheres to the budget to build a track record of fiscal discipline during pre-electoral periods and preserve the economic objectives”. Can you believe it and how the inflation numbers together with the borrowing are not totally the same, that is for the reason that the Budget Deficit has been set by the government of Uganda is on the size of the yearly budget instead of the GDP as the IMF they set it there, the number will significant better and also smaller. Still, the Yearly Review which was ‘Value for Money’ told the same, even if the number will be different next year from URA and Ministry of Finance, Planning and Economic Development (MoFPED) will hopefully drop similar numbers next time. Since the numbers for deficit are going up and also the loans because of missing donor money. While waiting for the money from the Oil Development. Still, wait for how the budget year 2015/2016 will go. Peace. 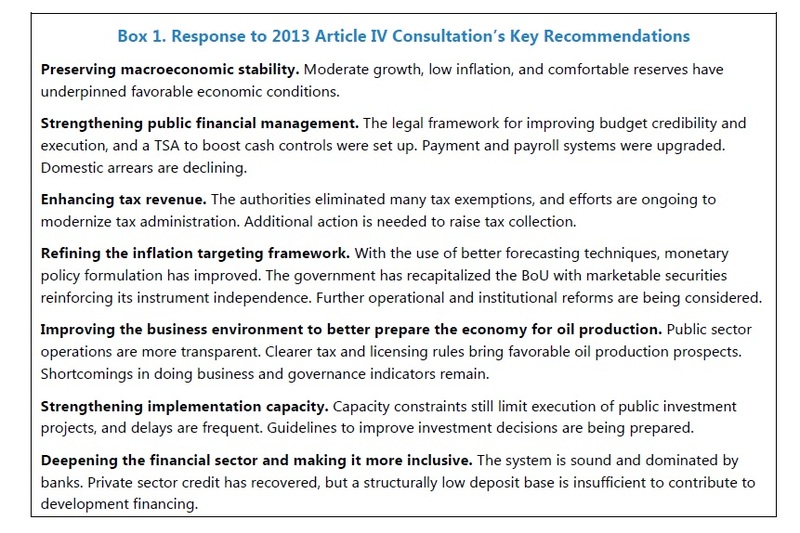 International Monetary Fund – IMF Country Report No. 15/175: STAFF REPORT FOR THE 2015 ARTICLE IV CONSULTATION AND FOURTH REVIEW UNDER THE POLICY SUPPORT INSTRUMENT—PRESS RELEASE; STAFF REPORT; AND STATEMENT BY THE EXECUTIVE DIRECTOR FOR UGANDA (July 2015).